The Library of the University of Illinois at Urbana-Champaign (UIUC), the largest publicly funded university library in the country, has long been engaged in state, national, and international efforts to make its resources accessible to scholars, students, and the general public. Digital library initiatives at the University of Illinois at Urbana-Champaign began in 1994 for the dual purposes of providing digital access to the University Library's rich collections and conducting digital library research to advance the creation and use of digital resources. Today the UIUC Library is actively engaged in large-scale digitization of its collections through in-house and out-sourced projects, and its participation in the Open Content Alliance and the CIC Google Library Project. It has also recently launched the Illinois Harvest web portal, which provides organized and thematic access to digitized and born-digital resources about Illinois, created by Illinois scholars, or included among the digital collections of the University of Illinois Library. The Illinois Digital Environment for Access to Learning and Scholarship (IDEALS) is a set of digital collections and related services that together constitute the campus institutional repository. Chicago U.S.A., an illustrated map of Chicago, youthful city of the big shoulders, restless, ingenious, wilful, violent, proud to be alive! Boston: The Tudor Press, 1931. Courtesy of the University of Illinois Library. Used with permission. Platforms in use at the UIUC Library include ContentDM for images; DSpace for the IDEALS institutional repository; DLXS-XPAT for textual databases, such as the TEI-based Kolb-Proust Archive for Research; and ARCHON, an open-source web-based tool for archives and manuscripts developed by the UIUC Library and available free of charge to other libraries and archives. Local servers host the PDF, DjVu, and OCR access formats and JPEG2000 archival formats for all UIUC's full-text books digitized through the Open Content Alliance. Either item level or collection level records for all our digital objects are added to the Library's OPAC as well as to WorldCat. Most notably, however, collections from all these platforms are aggregated, delivered, and fully searchable via the Illinois Harvest web portal. Illinois Harvest is powered by a combination of technologies, including the Open Archives Initiative Protocol for Metadata Harvesting (OAI-PMH), and Search Assistant, a locally developed software system that finds both image- and text-based resources spread across many databases and websites. As such, Illinois Harvest not only delivers digital content created by the UIUC Library, but also digital content related to the state of Illinois or created by Illinois scholars that resides on servers worldwide. Currently, Illinois Harvest has harvested the metadata for over 38,000 digital objects in 63 collections. 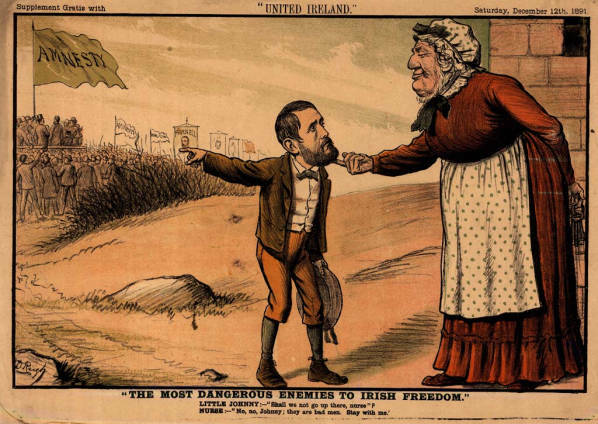 Cartoon "The Most Dangerous Enemies to Irish Freedom," 1891. Courtesy of the University of Illinois Library. Used with permission. Illinois History and Culture contains an ever growing number of important and unique full-text books and pamphlets from UIUC's Illinois History and Lincoln Library, including early general histories of Illinois and its principle cities and towns; pioneer experiences in Illinois; Lincoln and the Civil War; Native American history in Illinois; and much more. This content was digitized through the Open Content Alliance. Unica consists of full-text books from UIUC's Rare Book and Manuscript Library that are the only known copies in existence. 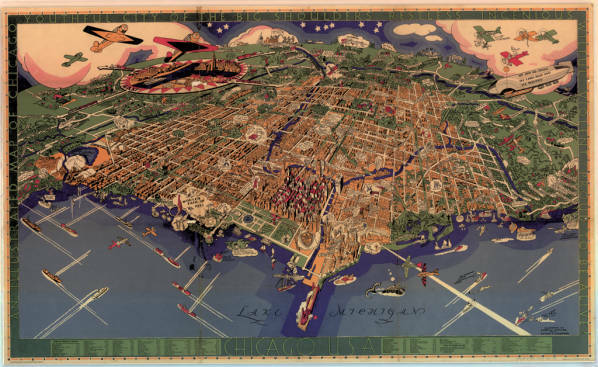 Historical Maps Online consists of digitized images of maps charting the last 400 years of historical development in Illinois and the Northwest Territory. Teaching with Digital Content is a collaborative multi-institution collection created to help integrate digital primary source materials into K-12 curriculum and assignments, as well as into the educational programs of museums and libraries. Collins Collection of Irish Political Cartoons consists of images drawn primarily from the Weekly Freeman and National Press and United Ireland newspapers. They address the subject of Irish politics of the late 1800s and early 1900s and, in particular, Ireland's relationship with England. French World War I Posters presents digitized versions of 105 posters published in France during the First World War, representing a time of national volatility and a visual culture of lithography, illustrations, earlier posters and paintings. German Emblem Books from the largest U.S. collection of continental emblematica. UIUC Library also hosts the OpenEmblem Portal. The Motley Collection of Theatre and Costume Design is a rare collection of original materials on the theatre comprising over 5000 items from more than 150 productions in England and the United States. These materials include costume and set designs, sketches, notes, photographs, prop lists, storyboards, and swatches of fabric. Portraits of Actors, 1720-1920 includes almost 3500 pictures of actors-studio portraits and actors posing in costume for a particular role or performing a scene from a play. Dramatists, theatrical managers, singers and musicians are also included, but the majority are British and American actors who worked between about 1770 and 1893. ALA Archives Digital Collections containing digital images from the Faxon Collection of ALA conference photographs and library building photographs. 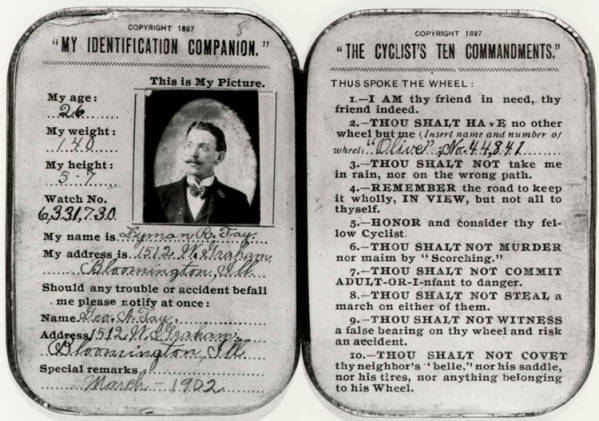 Cyclists' Ten Commandments & ID Card, 1897. Courtesy of the University of Illinois Library. Used with permission. Please also visit our Digitized Book of the Week blog, featuring news and highlights of the large scale digitization initiatives at the Library of the University of Illinois at Urbana-Champaign.